I’m a bit behind on my plan to review twelve classic SF novels in 2016. Well, no surprises there – my reviewing projects always take longer than I expect them to. 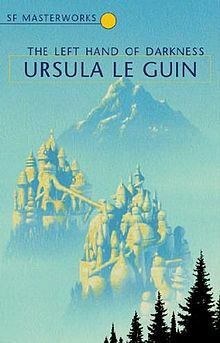 The Left Hand of Darkness by Ursula K. Le Guin, published by Ace in 1969, swept the genre awards in the year I was born. It’s still regarded as one of the top four or five science fiction novels of all time (source Locus Magazine readers poll 2012, and I’ll happily fight anyone who thinks Ender’s Game or the Foundation series are better books than this). The story concerns Envoy Genly Ai, who has been dispatched on a mission to invite the planet of Gethen (also known as Winter for its unusually cold climate) to join the Ekumen, a sort of cultural/trade network of technologically advanced worlds. Ai’s task is to encourage the planet’s leadership to make contact with the wider universe, but for two years the fickle ruler of Karhide, one of the larger Gethen nations, will have little to do with him. On the eve of his long-awaited audience with the ruler, Argaven, political upheaval leaves Ai exiled and estranged from Estraven, a noble he believed to be his only ally until an act of apparent treachery. The rest of the plot involves Ai’s escapades as he seeks support in a neighbouring country, only to find that the suspicious and self-serving politics of that place is every bid as dangerous as the ones he fled. Circumstances reunite him with Estraven as the two of them flee persecution across a desolate ice sheet in the depths of winter, as Ai looks for a way to contact his support ship. The Ekumen is made up of human worlds, but Gethen’s populations is uniquely “ambisexual” meaning that they are essentially genderless most of the time. They exhibit sexual characteristics and behaviour only during a brief window for two days a month, a state they call kemmer, during which they may become male or female. The political dramas and harrowing survival adventure give the book their main plot, but it is Ai’s interaction with and gradual understanding of the implications of a society unaffected by sexual discrimination, violence or intimidation where Le Guin really digs in. While skirmishes are common in disputes over land or property, for example, full-scale national wars are unknown on Gethen, a revelation that Ai struggles with but I personally found plausible enough. Some of the gender discussion feels a little dated reading it in 2017, but considering Le Guin wrote it in the late 60’s it holds up remarkably well. (I think, were it to be written now, Le Guin might not be reluctant to use the non-male pronouns for her ambisexual characters, but I can see how it might have muddied the language back then). And in case I’m underselling it, this is a breathtakingly thoughtful, insightful and touching novel, with just a few light touches of survival horror and political thriller to keep things moving. Le Guin manages to pack a lot of theme into less than 250 pages – The Left Hand of Darkness covers politics and survival, gender and its cultural impacts, communication and miscommunication, the interplay of religion and mythology, loyalty and duality, with deep thought and insight into each. The SF tropes in play – first(-ish) contact, precognition, telepathic communication and hidden orbital relay satellites – are set to one side when Le Guin doesn’t need them to illustrate her themes. Apart from anything else, her wonderful control over the craft of writing is exemplary. The first thing that came to mind when thinking about TLHoD’s influences was a really forgettable Star Trek episode featuring Will Riker, but let’s skip over that. This is obviously a groundbreaking work that helped pave the way for generations of social and feminist science fiction, and its echoes are evident even now. I suspect I’m not nearly widely enough read to appreciate the full extent of its impact (Anne Leckie’s Imperial Radch trilogy is the most recent example I’ve read of a work in nodding conversation with Le Guin). Awards: Nebula Award for Best Novel 1970, Hugo Award for Best Novel 1970; James Tiptree Jr Award 1995 (The James Tiptree Jr. Award is an annual literary prize for works of science fiction or fantasy that expand or explore one’s understanding of gender). This entry was posted in Visiting Classics and tagged anne leckie, ender's game, foundation, hugo awards, james tiptree jr award, locus magazine, nebula awards, Star Trek, the left hand of darkness, ursula k le guin. Bookmark the permalink.